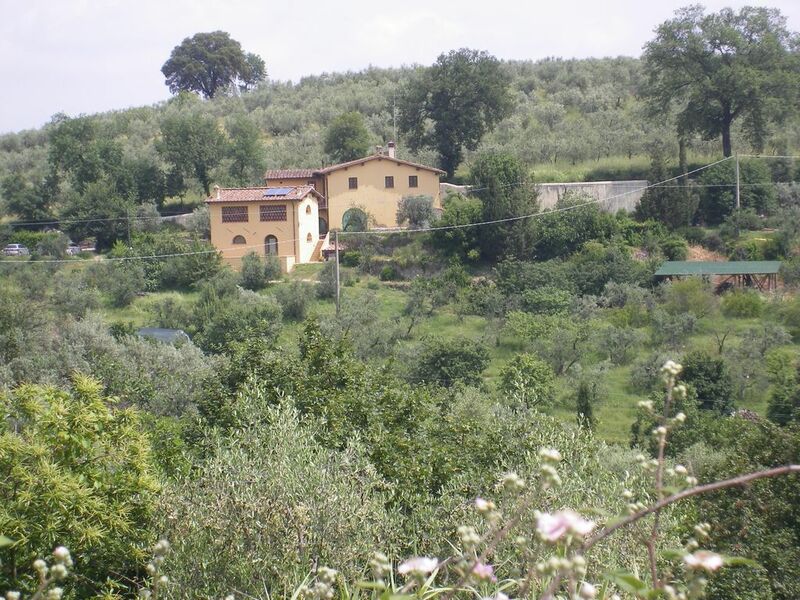 Il Fienile, an independent structure recently restored following the criteria of the Tuscan tradition, is located in a hilly area with a landscape connection, surrounded by olive groves and vineyards. Our guests can enjoy the pleasure of a stay in the countryside, in total privacy, immersed in nature and far from the chaos of the city but only a few minutes from the city of Florence. In the old farmhouse, on the property, live the owners who are engaged in the work of the farm and happy to be of help to guests. Il Fienile offers all the comforts of a modern home to make guests feel at home. From the large south-facing sun terrace you can enjoy a beautiful view of the panorama of rolling hills cultivated with vines and olive trees. The small farm where the Barn is located breeds free-range chickens and rabbits for family use. Depending on the season it is possible to admire the splendid blooms of different botanical species including azaleas, gardenias, camellias, lilies, calla lilies and fruit trees. It is also possible to make pleasant excursions on foot in the surrounding countryside, for example, to discover the church of San Romolo situated on top of a hill overlooking the Arno valley. Going down to the valley, just 3 km, there is a shopping center and the historic center of Lastra a Signa with restaurants offering typical dishes of Tuscan cuisine. At 8km there is the tramway station which, every 3-5 minutes and in less than 30 minutes, leads to the central station of Florence, and is certainly the fastest and most convenient way to reach the city. Il Fienile is ideally located for excursions to discover the many wonders of Tuscany such as Prato, Pistoia, San Gimignano, Siena, Pisa, Lucca, Certaldo and many, many others. The tourist tax is Euro 1.50 / person for the first 4 days and to be paid in cash upon arrival. Final cleaning and utilities are already included in the booking price. THE TOURIST TAX of Euro 1.50 / person / day for the first 4 days is to be paid in cash on arrival. A deposit / security deposit is required for any damages of Euro 250 to be paid in cash upon arrival, which will be returned, upon verification, upon departure. Our stay in this house started with a fantastic homemade jam, olive oil and eggs from the farm. I think that this is a calling card already for the house. Alba and Paolo met us and were very helpful. A very comfortable and spacious house at a quiet area. The house is exactly as described. The territory is big and green. We enjoyed the view of typical Tuscany landscape from the window. After visiting Florence sights we could relax at a calm and peaceful place. The rooms were spotlessly clean and the kitchen was very well equipped and new. We were impressed by the plants on the territory especially with the olive trees with fruits on it. We highly recommend the house because the location and the house are wonderful! A magical 12 days with gracious and generous hosts - don't miss it. Thank you Madeleine and John. It was our pleasure having you here and are so glad you enjoyed your stay. Buio waits for your treats in front of the kitchen door in the morning. I am sure he also misses you. We hope to have you over again! Siamo veramente contenti che abbiate passato un gradevole soggiorno da noi. E’ stato un piacere avervi. Grazie per le vostre gentili impressioni. Il Fienile, surrounded by nature, is located in a hilly area surrounded by olive groves and vineyards in a peaceful environment. Being just a few kilometers from the main roads (highway A1, FIPILI expressway, train station, tramway and airport) it is in a particularly favorable position to visit any tourist attraction. Moreover, the village of Lastra a Signa, which is part of the metropolitan city of Florence, offers a small and characteristic historical center with its medieval walls and gates. For music lovers, also in the Municipality of Lastra a Signa, we have Villa Bellosguardo also known as Villa Caruso, home of the famous tenor and now dedicated Museum. All'arrivo dovrà essere pagato in contanti: - TASSA di SOGGIORNO di Euro 1,50/persona/giorno per oltre i 14 anni per i primi 4 giorni - DEPOSITO A CAUZIONI di Euro 250 che verrà restituito, dopo verifica, alla partenza.